The Bureau of Labor Market Information and Strategic Initiatives houses Michigan's State Demographer. The State Demographer is Michigan’s representative to the Federal-State Cooperative for Population Estimates (FSCPE) which is the main program at the U.S. Census bureau through which Michigan has input into the estimates for total population and population by county, city, age, gender, and other factors. Additionally the State Demographer is the lead for the State Data Center (SDC) program which is also a cooperative program administered by the U.S. Census bureau through which Michigan has input into the annual population estimates and the decennial census programs. The SDC also maintains a network of stakeholders throughout the State of Michigan that serve to advise the public and assist in data dissemination, collection, and analysis. Beyond serving as a liaison between state and the U.S. Census Bureau, the State Demographer also assists state, county, and local government officials; non-profits; businesses; and the general public with their needs for demographic data. The State Demographer is available to assist with most data request involving Census data and to make presentations regarding those data across the state. For further information please contact our office or the State Demographer directly. If you have questions about the program or need specific data, please visit The U.S. Census Bureau, Michigan Census QuickFacts, American Fact Finder, or contact us. Small Area Income and Poverty Estimates (SAIPE); Single year, model-based estimates of poverty for every county in the U.S. 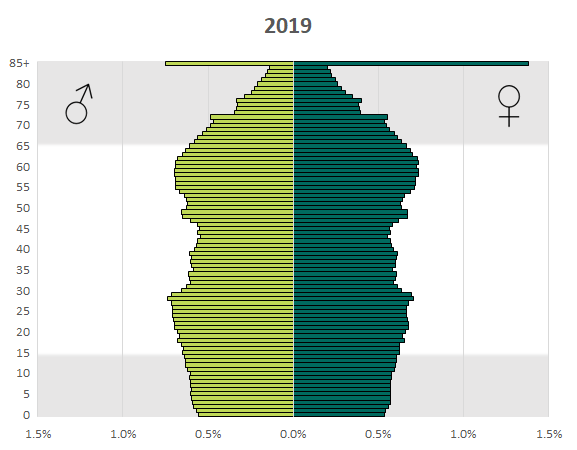 The tool above provides a visual representation of the change over time in the median household income and the racial composition of the population in the City of Detroit and the surrounding communities and townships. There are four variables shown on this chart: on the vertical axis, we have the households’ estimated median income, and on the horizontal the percentage of non-Hispanic Whites in the total population. Each bubble represents a specific area, and its size reflects the magnitude of the population. Additionally the “Ring” variable is color coded and represents a measure of the distance from the City of Detroit. The colors correspond to the colors on the map below the chart. These variables are traced over three decades with data starting in 1980 and continuing to 2010. It is recognized that percent white is not the best measure of the racial composition, but it is a variable that can be traced back in time through various censuses like other racial variables cannot. Placing a measure of racial composition on an axis opposite to median income is not meant to imply any causal relationship; rather it is meant to highlight how communities have changed over the period. Some items of note are the decreasing median incomes over the period. Nearly all communities end the period with a lower real income than in the beginning of the period. All income data are in 2010 dollars. Another interesting aspect is the nature of the change in racial composition over the period. For most communities, the decrease in percent white means that the population is becoming more diverse. For Detroit and a very small number of other communities, it means the opposite.